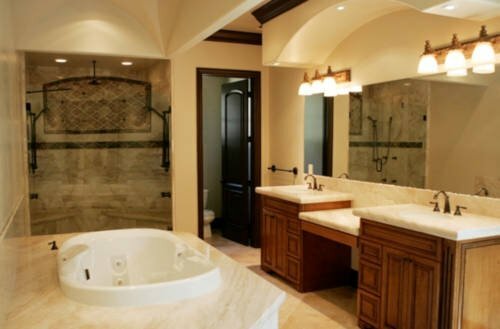 Whether you are looking to improve the resale value of your home or simply want to improve your own life, a bathroom remodel can help you accomplish your goals. That is, of course, as long as you find bathroom remodelers near you that are affordable, have a good reputation, and are willing to work with you to achieve your dreams of a beautiful, updated bathroom. Finding the right bathroom remodeler for your needs on HomeAdvisor is easy. Enter your zip code and we'll connect you with local, quality partners. Know your goal. What about your bathroom do you want to change? Are you simply looking for an update, or an entirely new room? Will you need a new shower, tub, or both? Find your style. Modern, contemporary bathrooms can be beautiful, but so can more elegant, classic alternatives. Find the style that matches both your preferences and the rest of your home. The type of bathroom also impacts your choices here; a guest bathroom will probably need a more neutral style than a lavish master bath retreat. Choose a layout. You might be constrained by the existing proportions of your room. But even within these proportions, you can still lay out your bathroom in a way that maximizes its function. Make sure that you can fit everything you want and need, while still having enough room to comfortably maneuver in the space. Of course, the right bathroom contractor can help you determine these steps, and provide you with some options to get started. But if you at least have a general idea about each of the above points, you can more easily find a remodeler that will help you build a beautiful, new bathroom retreat. As you might imagine, the average cost of a bathroom remodel ranges widely depending on your individual needs. Most homeowners spend between $5,666 and $13,031 on the project with an average cost of $9,348. But depending on the complexity of the remodel, you could pay as little as $2,600 or as much as $20,000. The best way to get a better idea for your individual bathroom renovation is to break these costs down by the items you need. Installing a new bathtub, for example, will likely cost you between $2,600 and $4,100. Smaller footprints result in reduced costs, while custom-built accessories may be more expensive. Work with your contractor of choice to get an estimate specifically for your space. "The work that Remo Contractors did on our home renovation project is absolutely beautiful! Remo Contractors remodeled our kitchen, bathroom, installed custom closet doors, crown molding, tile floors, recessed lighting, an oak stair railing, & painted the home's interior. If you are looking for full customer service at no extra cost to you the consumer, then Remo Contractors hits the mark. The quality is unsurpassed. Matt, the owner, was on site daily working with his crew. Matt oversaw the entire permit and county inspection process. It was worry-free having Matt in charge - and it made life very easy for our family during the remodeling. " "I Love My Kitchen. My kitchen was way overdue for remodeling. I was interested in having a more functional kitchen and a kitchen that sparkled and this is exactly what I got. I enjoyed working with Bobby on designing this new kitchen, and I appreciated his recommendations and suggestions. As we worked on the design, I could envision what the finished kitchen would look like. I liked what I was seeing. In addition to the design we came up with, there were other things that attracted me to Remodel USA. Remodel USA does not begin the work until everything is on hand, which helps ensure the process goes smoothly. Another huge selling point for me was that if there is any kind of problem (flooring, cabinets, faucets, etc. ), I have only to contact them. There is no having to keep track of whom to contact for the different types of issues that might arise. Ever and Jose and others involved in doing the remodeling work, and Marcin as the project manager, were a pleasure to work with. I appreciated their attention to detail and the pride they take in doing a good job. For the most part, all the aspects of the work were well coordinated. There was a miscommunication about some electrical work that was needed, and this caused some complications. Also, sometimes responses to my text or email messages took longer than I would have liked. A time or two, whatever it was I was asking about was being worked on, but I had no way of knowing that. I put off getting my kitchen remodeled because the process seemed so overwhelming. Now that I have this beautiful new kitchen, I regret not having had the work done years ago. Remodel USA helped make the process manageable, and I am loving my new kitchen! " "I spoke to four companies before making my decision to remodel my bathroom. United Capital Construction helped me streamline the process and understand the cost for labor and material. The manager made the whole process very efficient and was involved everyday in the project. The crew was very courteous and on time everyday. They helped make my bath more efficient by installing a pocket door. The work is absolutely beautiful. I would easily recommend this company!" "I would highly recommend them. They were very helpful in helping us find the right tiles and paint in advance. They were very prompt and courteous. I will definitely go to them again next year when we plan to remodel our kitchen. Our bathroom looks amazing!" Power Marble & Granite, Ltd.
"Power Marble worked with us to determine the optimum plan to completely remodel our master bathroom. The workmanship was excellent and they finished essentially on schedule in spite of some unforseen issues. Overall, we feel the Power Marble team gave us good advice from design concept through construction and we achieved an excellent outcome. We also received excellent value for what we paid." "A wonderful no pressure no stress experience from start to finish for my bathroom renovation! I am thrilled with the outcome which included installing marble tile on the floor and tub surround, (inclusive of decorative trim & niche), installing a new vanity, hardware & toilet. Travis was extremely attentive to the project and made it a point to check in frequently thru out the progress. Jhonny did excellent tile work & paid close attention to detail with beautiful results Great Service overall with excellent results while also being cost effective! I will definitely look to Geotek for any future projects! " "My wife and I had a meeting with Brad and Ryan with the intent of Ã¢Â Â shopping aroundÃ¢Â Â for a basement remodeling company. Our basement had major issues with dampness and after having the issues resolved with waterproofing, we were looking to create a multi use space. They were attentive to designing a space to meet our needs but most importantly, we were impressed with the basement system because it is moisture resistant, mold resistant, and sound absorbant. Additionally, it has a life time warranty! Working with Remodel USA was a no brainer. We look forward to the next steps in our partnership. Weâ re given 5 stars and will return after the work is completed. " "Bret and his team did a great job with our basement remodel. We are very happy with his work, his prices were reasonable and he stayed in budget. " "Absolut Tech showed their expansive experience and detailed workmanship throughout our projects. They were able to provide professional design options for our master bathroom, our completed bathroom looks better than many spa resorts. Rodney gave us one of the best price models when compared to other bathroom remodel companies. They found and corrected issues from when the bathroom was first constructed 20 years ago and replaced all of the old plumbing. The team even spotted an exterior window leak that began to drip into the baseboard and fixed it for no charge. Absolut Tech was more than helpful in every step of the project, we were always consulted for our advice on decisions and were kept informed about each phase. Rodney made sure that both my wife and I were extremely happy with the excellent work that they performed. We had no surprises as the team was thorough and precise during the demolition and construction. Rodney did not try to force a certain set of products on us like many remodel centers do, he allowed us to compare prices across all distributors and we picked the best valued items and saved money. We LOVED their dedication and amazing work, we immediately had them complete our unfinished basement bathroom. Rodney goes above and beyond to make sure each facet of the project is perfect. I could not have asked for anything more from the master bathroom remodel or our basement bathroom installation. I would never even think to look anywhere else for any other renovation project in the future!" "Project: Remodel a Bathroom The entire team from sitting down with Sirous to the team coming out to conduct the remodeling was excellent. We would recommend them to anyone and look forward to future remodeling projects. " "Ryan Reph Remodeling has completed three major projects for me in the last three years. The first project involved the installation of a new oversize walk-in basement shower and renovation of the adjacent basement laundry room. I was so pleased with the quality of the work, the following year I hired them to renovate the master bathroom, original to 1958 when the house was built. A complete tear-out was required and new everything was installed inside and outside the bathroom walls. Even though I selected moderately priced materials, the end product was stunning. I recently moved into another older house, and they are almost finished with two projects there. One involved the construction of a main level laundry/mud room with an entrance from the garage into the house and the other was the installation of a wet bar/kitchenette in the basement rec room. Like the previous projects, the end result of these two projects is amazing. Within the next year or two I am hoping to renovate the basement bathroom in the new house and Ryan will, without doubt, be my contractor for that project as well. Before my first experience with Ryan, I had never hired a commercial contractor to do any work for me. I was fortunate to have a Dad who could do anything and do it beautifully. He and I were able to tackle all of my various home improvement projects. When I lost my Dad my home improvement projects were limited to various painting projects and small focused specialty projects (floor refinishing, replacement windows). I had heard horror stories from family and friends about working with contractors and simply didn&#39;t want to get involved in a major project where I had to rely on someone I didn&#39;t know. But the time came when I needed access to an ADA accessible shower, so I turned to one of the online contractor referral services and found Ryan Reph Remodeling (RRR). I reached out to RRR, and they contacted me almost immediately. Selwa came to my home, reviewed the scope of work and provided an estimate. Ryan followed up to walk through the project with me. I felt the estimate was fair, I was very comfortable with Selwa and Ryan, and after contacting the references they provided I signed a contract to have the work done. (Yes, RRR was the only contractor I contacted!). They have now done 3 projects for me and I can&#39;t imagine working with anyone else. I have worked with two of Ryan&#39;s crews. Both crews were very professional skilled, knowledgeable and talented. Every worker Ryan has sent into my home has been polite, friendly and helpful. They show a great deal of respect for my home and use drop cloths, dust barriers and floor protectors while they work. At the end of each workday they clean up, put their tools and materials away and leave the house as livable as practical during a major construction project. Ryan gets all required permits in his name, his crew members are onsite to meet with the county building inspectors when they conduct the "
"I happily recommend OHI to anyone who wants to do a professional quality bathroom remodel. The service they provided, beginning with the initial contact, was excellent and the cost was in line with the excellence of the work and the personal service I received throughout the project. The project was managed flawlessly by a senior company representative, an excellent onsite team leader, and highly skilled workers. Plumbers, electricians, permits, and disposal were handled for me. There was no picking up the pieces or being nickeled and dimed. The work was done according to schedule and it met or exceeded contract requirements. I was given ample choices, and was able to design a bathroom that met all my personal, structural, functional, and aesthetic requirements. My bathroom is even more than I hoped it would be! " "Great communication and customer service. Cost was what I expected. Stands by his bids and completes work as promised,"
"They were very pleasant to work with." "If I could give this company 10 stars for customer service, I would. Gary responded promptly to all my questions, anticipated my needs, and covered every aspect of the repair project with professionalism. His workmen showed up as promised and completed the work with excellence. Gary went above and beyond the repair work to help us with our problem. This was a very big job and they handled it beautifully!"